We have 435 Representatives in Congress because of a historical anomaly. Throughout most of American history Congress grew in size as the nation grew in population. That changed in 1920, when Congress failed to pass a re-apportionment bill after the 1920 census. The number 435 was set in the Apportionment Act of 1911. Actually the 1911 Act set the number of Representatives at 433, but said that Arizona and New Mexico would each get one seat when they became states, which they did in 1913. In 1929 Congress pass a Reapportionment Act of 1929 that set the number of seats in Congress at 435, and that number has remained ever since. As the U.S. population has increased, the ratio of representatives to citizens has changed dramatically, and our government has become increasingly less representative. In the First Congress there was one elected Representative for every 33,000 constituents. Today there are on average just over 710,000 constituents for each elected Representative. This means that we are roughly 20 times less representative then at the founding. Not only has Congress grown less representative by lack of reapportionment, it has also created vast disparities in representation. Montana has one Representative for a population of roughly 990,000 citizens, while Rhode Island has two Representatives for a population of 1.1 million, or one Representative for every 550,000 citizens. While there will always be disparities, such a vast difference in representation is unfair, and makes hash out of the idea of equal representation. This was the first proposed amendment in the first twelve amendments sent to the states, but this particular amendment didn’t pass, in large part because the smaller states felt that this would give the larger states added political power. If this had passed, and had not been amended, the House of Representatives would now have over 6,000 members. Clearly this number is unworkable, and it would appear likely that Congress would have, over the years, altered the number of citizens per representative. 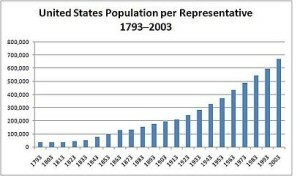 I think that we should set the number of Representatives based on the population, and not based on an arbitrary number set over 100 years ago. If we set the number based on the proportion at the last re-apportionment, there would be one Representative for every 200,000 people. This would increase the size of the House to just over 1500 Representatives. The smallest state, by population, is Wyoming, with roughly 580,000 people. If we set the apportionment number at 500,000, then Wyoming, Vermont, North Dakota, Alaska, South Dakota, and Delaware would have 1 Representative, and the total number of Representatives would increase to approximately 620. If we set the number at 300,000 (my choice) then only Wyoming would have one Representative, and the other five listed above would go up to two. This would also increase the total number of Representatives to a bit over 1000. This may seem like a lot, but compared to other modern democracies, it is still not very representative. The British House of Commons has 650 Members representing a population of roughly 63 million. Canada has 308 Members in the Lower House of Parliament, with a population of roughly 35 million. In both cases their legislative bodies are significantly more representative than in the United States, with roughly one member for every 100,000 citizens. Americans pride themselves on their democracy, so one might think that it is the most democratic, or representative democracy in the world, but it is neither. Here’s a chart showing the states with the current number of Representatives, and the number if the apportionment is set at 500,000 or 300,000. From the chart it’s obvious that the larger states gain the greatest number of representatives. This makes sense since it is the largest states that are currently the most underrepresented based on the current system. Some people and politicians in small states will certainly argue that this is unfair, but we need to keep in mind that the purpose of the House of Representatives is to represent people and not land area. The purpose of the Senate is to represent land area (as defined by state borders) alone. There are a number of benefits to increasing the number of Representatives, and setting their number based on population and not an arbitrary number. First, Representatives will be closer to the people. This will make it much easier for them to know their constituents, and deal directly with their concerns. Districts will be smaller, which should make elections cheaper. (Though with more candidates and seats, the overall cost may go up.) Smaller districts may make elections less reliant on expensive television advertisement, which might reduce the cost. Districts may even be small enough for a poorly funded candidate to win by meeting the voters directly, by walk door to door, shaking hands at county fairs, etc. Second, with the number of Representatives increasing with population, few states will be forced to redistrict because of the loss of Representatives. It is possible that this will result in Congressional districts that don’t change appreciably for a number of decades, as was the case before 1911. Finally, with more representatives there will be more opportunities for new people to enter politics. New people will bring new ideas, viewpoints, and possible solutions to national problems. While I think that this proposal (alone or in conjunction with multi-seat districts) has the potential to eliminate many of the current structural problems causing extreme partisanship, there is no doubt that there are some drawbacks. Chief among them will be the size of the House. 620 members may not be unwieldy, but 1000 might be. It may be physically difficult to accommodate them all in the current chamber. Most likely a system of “back—benchers” will develop, where less adept or vocal legislators will essentially take a back seat to older and more active representatives on the House floor. This is quite common in England, and in most parliamentary systems. The increase in numbers of Representatives would increase the cost, both in legislative pay, and the cost of legislative staff. One way to minimize this would be to decrease the size of the staff, particularly for new members. Congressional staff has grown dramatically over the past few decades, and the result seems to be that Representatives themselves are less involved and knowledgeable about legislation and the legislative process. One way to fix this problem would be for new legislators have minimal staff. Another possible solution is for new members to work for older members, not unlike in the British House of Commons. I am certain that there are other problems associated with this plan, but on balance I think that the advantages outweigh the disadvantages. If we believe in democracy, as do most Americans. I also believe in Representative democracy, as do most people. If we really believe in Representative democracy then we should increase the number of members of the House of Representatives to make our system both more representative and more democratic.